Kern River Valley Historical Society is the management, maintenance & supporting force for their crowning achievement, the Kern Valley Museum. Archives and spectacular displays interpreting the rich and complex social, cultural and economic history of the Kern River Valley are offered to visitors without charge. Through its exhibits, publications, and programs, we may trace who and what we are, how we achieved our distinct identity, and what unique contributions we make to the region and state. 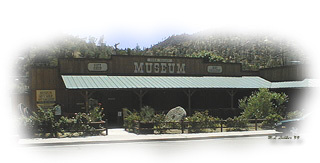 Located in Kernville, the museum is home to some of the most fascinating collections and exhibits that history can offer. When visiting the Kern Valley make this exciting treasure house a priority stop. You know of the beauty of this southern Sierra valley, its sunny skies, clear air and the fishing in Isabella Lake and the Kern River but.... do you know about the Valley's fascinating history? The history and legends of the Old West captured the imagination of the whole world and have been immortalized in print and on film. The Kern River Valley retained the atmosphere of that Old West long after most of California had moved on into the Twentieth Century. In the Kern Valley Museum you will find artifacts and memorabilia which make the history of this valley come alive. The museum displays objects used by the first known inhabitants of the area, the Tubatulabal, whose descendants live here today: a rain-making kit (shown right) used ceremonially by Tubatulabal Chief and Shaman, Steban Miranda, manos, metates, ancient obsidian hand tools, baskets, trade beads, arrowheads and other artifacts. It was the lure of gold which brought the first white settlers to the Kern River Valley in about 1853. The mining towns which sprang up were as rip-roarin' as any in the Mother Lode country, and from those exciting years we have various things for you to see, including some real local gold! On the heels of the miners came the farmers and ranchers. They saw the rich bottom lands and abundant water of the Kern River and envisioned productive farms and great herds of cattle. Many early ranchers, as well as those colorful characters, the cowboys, settled here and founded pioneer families. Among other things, we display significant items of early-day ranching: brands, blacksmithing tools and barbed wire. Many brands are still in use today. Lumbering in the nearby mountains, especially the Greenhorns, was essential to mining and the establishment of homes and businesses. The Museum contains representative tools of this industry. Some of the most famous western movies produced in the 1939s, '40s, and '50s were filmed in the Kern River Valley. Stars such as John Wayne, Gene Autry, Roy Rogers, Humphrey Bogart and Robert Mitchum shot the bad guys while local residents provided lodging and movie sets and served as extras. The Museum has a video library of many of these films for your viewing. The Museum Gift Shop features such items as museum T-shirts, Indian jewelry, wood products, night lights and magnets, geodes, rocks, arrowheads, children's toys, gold pans and leather pokes, beaded hat-bands, flowers in glass, local art, and all kinds of books: local area, hiking, flowers, animals, gold mining, Indians, cookbooks and coloring books. In association with the Kern River Valley Art Association, the Museum exhibits works of local artists. Exhibits are changed monthly, and works may be purchased. Additionally, the Museum features a special exhibit case which is changed monthly. Artwork & HTML Design ©2006-2008 M.L. Ludiker Artwork & Design. All rights reserved.